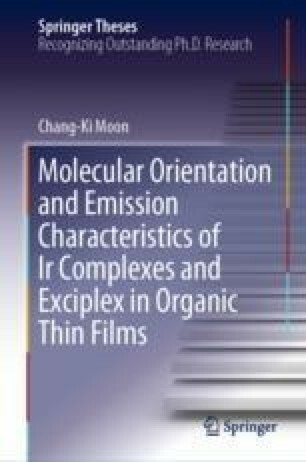 This thesis presented the principle and optical effects of the molecular orientation for thin films and OLEDs. It also introduced the application of molecular orientation in the analysis of the electronic structure of the bimolecular excited state. In Chap. 2, an optical model for emission in a birefringent medium was presented and the theoretical model was validated by applying it to the emission from a thin film and OLEDs. The optical birefringence affects not only far-field radiation properties such as emission spectra from the film and OLEDs but also the efficiency of the OLEDs. The emitting dipole orientation of a heteroleptic Ir complex doped in the birefringent medium was successfully analyzed from the far-field radiation pattern of a thin film. In addition, the birefringent model provided a precise analysis of angle-dependent EL spectra and EQEs of OLEDs. In Chap. 3, the molecular orientation of Ir complexes in vacuum-deposited organic layers were demonstrated by quantum mechanical analyses and molecular dynamics simulations. Ir complexes have spontaneous alignments by local electrostatic and van der Waals interactions with nearest host molecules interacting in a smaller scale than a molecule. Attractive interactions between the aromatic ligands of Ir complexes and hosts induce the horizontal dipole orientation and the interactions rely on the molecular structures of the dopant and the host. The increase of the dispersion force and electrostatic attraction on the aromatic ligands was effective on increasing the horizontal dipole orientation with lowered non-bonded interaction energy. In Chap. 4, the exciplex emission was modeled by a quantum chemical characterization of the CT states in a donor-acceptor blend. Various donor-acceptor geometries in the blend resulted in broad distributions of the energy and excited state dynamics. The energy spectrum of the solid-state exciplex could be understood by a product of the exciplex energy, the density of donor-acceptor dimer, and the probability of CT as functions of the CT distance. In addition, the larger delayed fluorescence from the lower-energy exciplex was explained by the narrower energy band of the triplet state than that of the singlet state in the solid state.